CONGRATULATIONS Danielle Turner on Facebook is the winner! “This is Nessie” have turned their famous footnotes stationery into bespoke prints and gifts. Completely unique, you can build a family or household out of wellies for a charming and unusual present. Line up all the children, and maybe grandchildren too, in their wellies. Without all the muddy footprints, get them on your own bespoke glass chopping board worth £33.25. 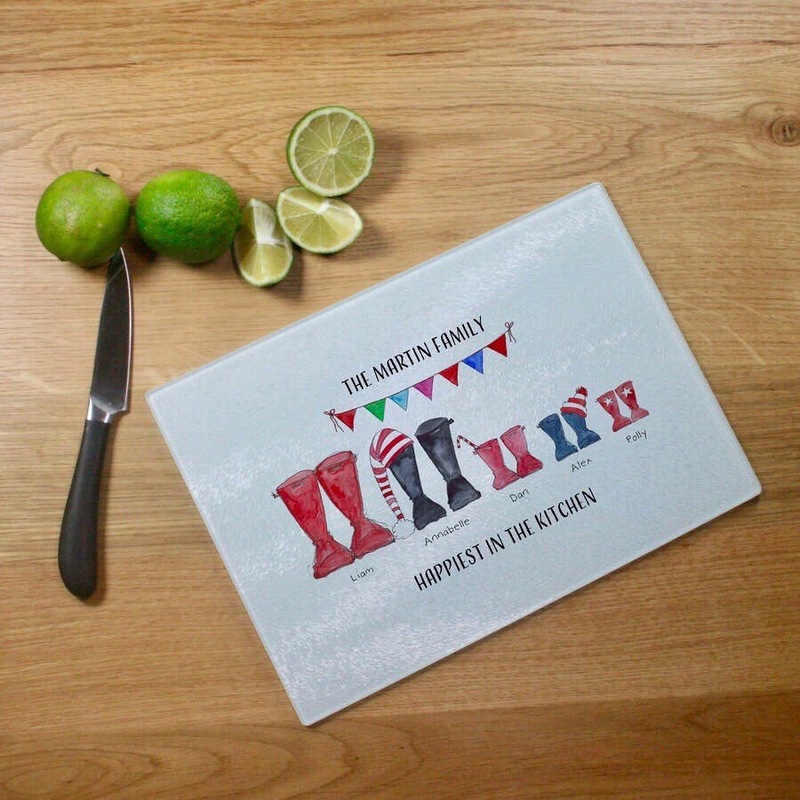 The winner can personalise their glass chopping board by choosing a pair of wellies for each family member, with the option of adding a Christmas feel. Just supply the names and ages for sizing of the wellies. Choose a title for the top of your print, and there is also space at the bottom for you to be as creative as you like. Instagram: Like and Follow on Instagram @Concierge_Angel & @AlysonatthisisNessie with #winwellies. Be sure to tag a friend who you think would love to be in with a chance to win too. Enter on Facebook, Twitter & Instagram to triple your chances of winning. No purchase is necessary. Competitions are open to all UK residents except our employees, the companies or organisations with whom the competition or offer is being run, their agents, or anyone directly connected with the promotion. This competition is run with This is Nessie who are responsible for the provision of the prize. ConciergeAngel will not be responsible for or have any liability for the provision of the prize. We reserve in all cases the right to replace the stated prizes with other prizes that we consider to be of broadly equivalent value. There is no cash alternative for non-cash prizes, and prize winners must accept prizes in the form offered. Prizes are not refundable or transferable. The closing date for receipt of entries is as stated as midnight 25TH November 2016. The winner will be drawn at random from all valid entries, and will be notified via mode of entry on the 26TH November 2016 and must supply a UK address and personalisation details to AlysonR@thisisnessie.com promptly in order to receive prize in time for Christmas. All entrants to competition are deemed to have accepted these rules and agree to be bound by them, and agree to any publicity that may arise including their name being used on websites, or social media at any time as a result of the competition. Suppliers cannot be held responsible for the breakdown in communication systems that may result in a entry not being registered. The decision of the judges is final and no correspondence will be entered into. Winners will be selected at random from all entries. Prize may vary from images displayed.